Betonline is one of the largest online sportsbooks in the world with a fantastic reputation for being trustworthy. They are licensed in Panama and can legally accept US players due to the fact that they are located offshore. With big perks, a wide variety of betting options and fast payouts, we feel Betonline is one of the top options around. 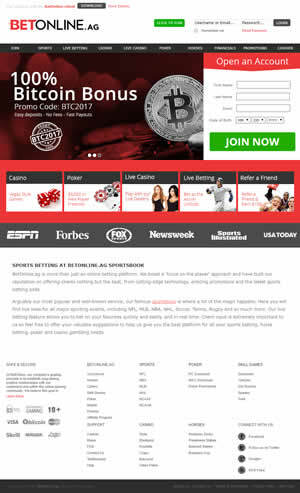 The BetOnline gambling group has been a privately help company since 2004, although they claim to have been involved in gambling since around 1991. The company is headquartered in Panama City, Panama, where they’re fully licensed and regulated. Judging by overall traffic received, BetOnline is in the top sportsbooks on the planet, which means they’re catering to a very large audience and have developed a strong reputation. After all, if they were conducting shoddy business, then their business would be trending down instead of up. This company is definitely a big-time player in the world of gambling. Not only do they handle a ton of classical sports wagers, but BetOnline was actually the first company to accept action on people climbing up Mount Everest. So to say that their betting types are diverse would be an under statement. We cover each aspect of their sportsbook in detail below. Having seen hundreds of different sportsbooks, we can say in all confidence that BetOnline is one of the easiest to use, especially if you’re a novice to this world. As soon as you load up the homepage, you have lines and sports staring you directly in the face. For instance, on July 22, what we saw when clicking on the site were Friday’s baseball lines, featuring a moneyline, an over-under line, and even a point spread. Having three separate betting lines on baseball alone is a great sign, but what’s even better is that the site is so easy to navigate. You see the main action of the day directly in the center of the site, but directly to the left are all the sports and lines that BetOnline is offering up. All you need to do is click on the tab and expand the offerings. You can also see the cashier tab right from the homepage so you can easily get your money into the site and check on your balance without having to chase down a few different pages. What you’ll also see over to the right is a bet slip, which will tell you how much money you have available and on which events and lines you have placed your money. For gamblers in the know who love to leverage and parlay their bets, this sort of accessible slip is a great feature to have so that you’re always a step ahead in your betting. Overall, we’d give the layout and user interface a solid 9/10. The color scheme leaves something to be desired, but that’s getting into quibbling. There’s certainly nothing wrong with the actual features and interface of how the site’s laid out. As we mentioned above, you can find point spreads, over-under lines and moneylines with all the popular sports on the site. But then you can get into prop betting and live betting, where you’ll be betting in real-time along with the action as it plays out. And using baseball as a quick example: You won’t just have a few choice games from which to choose if you want to bet live. You’ll actually get the same sort of live options for every game that’s being played. You can also click on the live betting feature and check out the live events that are coming up. For instance, you can see when the football events are coming up, or other sports. So you can schedule your live bets and get in there and really leverage your action minute by minute. When it comes to the types of sports on which you can bet, you have baseball, basketball, football, hockey, soccer, tennis, auto racing, boxing, cricket, darts, golf, martial arts, rugby, lacrosse, Olympic action, snooker, softball, and all sorts of futures and props. We’re impartial here and aren’t out to toot anyone’s horn, but BetOnline certainly provides a wide range of betting options and types. When first examining this site, we didn’t see a ton of banking options from the homepage, but that’s why we dig in, bet with the site, and explore it all. After checking it all out, what we found were all sorts of banking options, so there’s no real reason that you couldn’t deposit or withdrawal here. There’s a system for everyone. For starters, you get the classic credit card features via MasterCard and Visa. Though you’ll also get options like Person to Person, Money Orders, Skrill, Neteller, Book to Book, a bank wire or check, Diner’s Club, JCB, and our personal favorite, the cream of the crop, Bitcoin. As a Bitcoin site, you can deposit and withdrawal with BetOnline for free and instantly every single time you want to handle the banking. Simply click on the Bitcoin option and follow the easy instructions. In addition to Bitcoin, BetOnline also accepts other popular forms of cryptocurrency including Dash, Litecoin, and Ethereum. Multiple crypto options set BetOnline above the competition in the digital currency world. For banking options, BetOnline demands a 10/10. They simply have every sort of popular option that an American gambler could want. As we said at the very start of this website in general, we’re going to be perfectly honest about these sites, not just parrot their strongest points. So when it comes to bonuses, we were going to say that we’ve definitely seen better. But at the same time of writing and posting this review, Betonline updated their bonus offer to a 50% bonus up to $1,000, and the rollover requirements are only 15X which is a hell of a lot better than a lot of sites. In addition, there are all sorts of lucrative ongoing bonuses. For instance, you can take advantage of the 25% bonus for life promotion, their $25 Live Betting Free Play promotion, as well as the $50 Mobile Betting Free Play. Check out the rules and regulations at the site, as these promotions are subject to change. Though for the sportsbook, you’ll also get a 7% track rebate on horse racing, a $25 risk-free bet, and more. At the end of the day, we would have to say that BetOnline easily beats out the competition when it comes to how they reward loyal players. In January 2018, BetOnline unveiled their new Player Props tool which allows users to customize their own wagers on player performance as opposed to simply betting on odds or line given by a sportsbook. It’s as simple as picking one or multiple players, select how you think they will perform, and BetOnline will give you the odds of what you selected in real-time. The more likely something is to happen, the less the payout will be, and the less likely something is to happen, the better the payout will be and it’s all displayed instantly. Overall, BetOnline Player Props is a good tool for anyone wanting more freedom and more options when betting on player performance. Can USA Residents Legally Play At BetOnline? Yes, a player who chooses to play with an offshore is essentially betting on sports legally because the offshore sites aren’t required to adhere to US law. The gambling laws on the books actually speak more to operating a site as a business on US soil. But they do not actually make the act of placing a wager illegal at all with the exception of 1 or 2 states. Overall, we’re tagging BetOnline with a 4.6/5. There are many reasons for this, and it all really starts as soon as you log onto the site. The layout and interface is incredibly user-friendly, and even a novice gambler can figure out how to operate things in only a few seconds. It’s a very intuitive set-up that makes it very easy to gamble. There’s also a whole lot of sports on which you can bet, and all sorts of lines from which you can choose; and if you want to get to the prop bets or the live betting section, there are all sorts of options to keep you busy. So no matter what sort of sport you like or what sort of style, you’re going to find something that you’ll appreciate. The same holds true with banking options. Bitcoin is the king in this day and age, but you can find a ton of different payment and withdrawal options, so no matter where you’re at in the US, you’ll be able to get your money in and out without charge and in an instant. The only real negative we encountered when vetting BetOnline was that they occasionally charge a fee on certain deposit options like credit cards. I’m not crazy about paying extra just to deposit funds that I will likely lose, but other than that they are rock solid and are easily one of the best sites around to both US and international players alike.